Order in the next 1 hour, 18 minutes an 6 seconds for same day shipping. 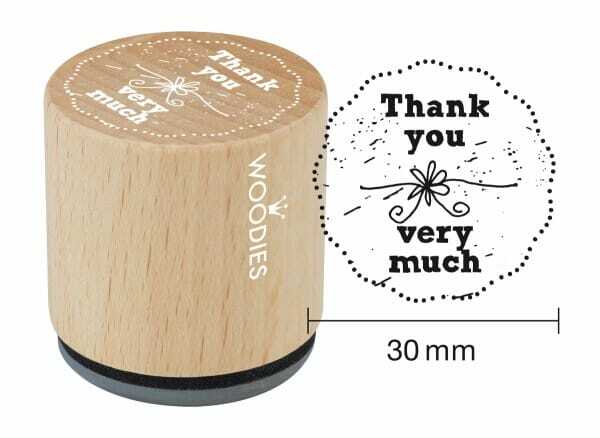 An easy and quick way to say thank you, the woodies stamp is perfect for creative crafters who want to add a more personal touch. Made from beech wood and 100% natural rubber, the dainty 30mm stamp features shabby chic 'thank you very much' text for a charming look. Ideal for professionals and enthusiastic amateurs alike, the woodies stamp will add a personal touch to your card, label or packaging. Customer evaluation for "Woodies stamp Thank you very much"